If you’ve ever taken a marketing or business course, chances are that you’ve heard of the elusive call to action! Just in case you’ve never heard of this term, a call to action (or CTA for short), refers to the preferred action you’d like your end user to take after consuming your promotional content. For example, have you ever clicked on an online advertisement and were redirected to a website page explaining the product or service in more detail? That page is typically referred to as a landing page in the digital world. Usually in the form of a static button, pop-up, or slider there’s an option to Buy now!, Learn More or Sign Up! There are TONS of other ones out there as well, but you get the idea. Those Buy now!’s are examples of CTAs. It’s literally calling on you, the potential customer, to act based on what you’ve been shown so far. In a hectic world full of ads in every single form of that you could imagine, CTAs are incredibly important for getting customer conversions. Where many people get stuck is when their CTAs become monotonous and boring. Well here are a few tips to get you out of that slump. CTA wording is a lot tougher than it initially appears to be. Believe it or not, something as simple as Take a look! versus Buy now! can impact whether someone converts or not. Here are some of the things you should ask yourself when rewording your current CTAs or even if you’re starting from scratch. 1) Has my CTA been over-used? This happens a lot with basic CTAs such as buy now, call now, sign up now, etc. Maybe try something as simple as Customize now! or I want this! 2) Does your CTA create a sense of urgency? You don’t want to sound like an infomercial, but you want to encourage your potential customers to act sooner than later. 3) Is it concise? You DO NOT want to have a long-winded CTA if you can avoid it. Not only does a lot of text look really weird on a button, but it also bores the people reading it. Even though colors seem like a trivial area of exploration, they also can have a large impact on your conversions. Certain colors can play emotional tricks on our brains. I won’t go into a whole lot of detail on the psychology behind different colors, but it’s definitely worth a Google search or two! My major piece of advice regarding this is to pick a CTA color that stands out! Avoid neutral colors such as brown, white, black and grey. Another good rule of thumb is to use button colors that are the opposite of your primary branding colors. For example, if your brand color is a shade of blue, try using a button that is a shade of orange. You can refer to the image of the color wheel below to see what a potential button color for you could be. I’m all for testing and coming up with new ideas, but there is something that I need to expand on. When it comes to your messaging, consistency is key. Let me explain what I mean by this. Let’s say you sell vanilla ice cream and you’re old slogan was, “Enjoy everyone’s favorite classic”. Lets say to tie everything in that your CTA was Get a classic cone today! Now if you change your overall messaging to “Same great taste without the calories”, you might want to change your CTA to Eat smarter now or something to that effect. You want to make sure that your CTA is relevant to your selling points and not just randomly thrown in there. Font is a fun topic to talk about, but it can also be very tricky! The overall thing to keep in mind is KISS. For those of you unfamiliar with this acronym, it stands for Keep It Simple Stupid. There are so many font variations that are elaborate and fun, but you have to remember your overall goal: to sell. If your prospective customers and clients can’t read the CTA button on your website, you’re going to have a problem. Luckily for you, there are many readable fonts out there besides Arial and Times New Roman. Maybe try using Verdana, Helvetica or something of the like. When it comes to print, my personal favorite is the Adobe font Kefa. I actually incorporate it into my logo and print branding. Ask yourself this one question: Is my formatting predictable? This is such an easy trap to fall into, and I have many times. Heck, even the formatting of this blog tends to be repetitive week after week, but the difference between blogging and a profit-oriented business is that I’m trying to explain knowledge in an easy-to-read format whereas you are trying to sell something! People get bored easily, especially in today’s climate. 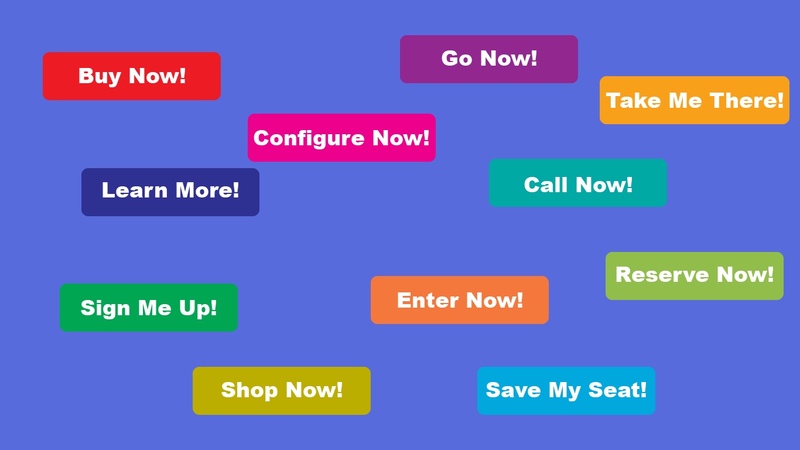 Try putting your CTA in the middle, or maybe repeat it 2-3 times throughout your landing page. There are so many ways to make small adjustments that could be surprisingly effective. What do you think is an example of an effective call to action?